Q:How long does it take to travel between Edmonton and Jasper? A: Approximately 5.5 hours which includes travel time and restroom stops (364 kilometres or 226 miles). Q: How long does it take to travel between Calgary and Jasper? A: Approximately 7 hours which includes travel time and restroom stops (415 kilometres or 258 miles). Q: How long does it take to travel between Calgary and Banff? A: Approximately 2 hours (129 kilometres or 80 miles). Q: How long does it take to travel between Banff and Lake Louise? A: Approximately 30 minutes (59 kilometres or 37 miles). Q: How long does it take to travel between Lake Louise and Jasper? A: Approximately 3 hours (233 kilometres or 145 miles). Q: Where is the SunDog Tours Desk at the Calgary International Airport? A: There is not a SunDog Tours Desk at the Calgary Airport but you may check in with the Brewster Transportation Desk at Arrival Gate C.
Q: Where is the SunDog Tours Desk at the Edmonton International Airport? A: There is not a SunDog Tours desk at the Edmonton Airport. All pickups will be at Exit #10. A: 24 hours prior to the departure time of your tour. Q: Do you offer door to door service? A: Yes. We offer pick ups and drop offs at all accommodations in Jasper, and all the major hotels in Lake Louise and Banff. Q: Do you pick up and drop off guests at every accommodation in Calgary? Q: How many people can your vehicles accommodate? Q: Do you allow pets on your buses or tours? A: Unfortunately we are unable to accommodate pets. Exceptions made for service dogs. Q: Are your vehicles wheelchair accessible? A: No. However if the guest is able to walk up the three stairs to the bus themselves we will be able to accommodate them. Unfortunately we are unable to carry motorized scooters or wheelchairs on our vehicles. Q: Is it possible to reserve a seat? Q: How much luggage am I permitted to bring onto your vehicles? A: 1 piece of luggage (50 lbs), plus $30 for each additional item. Q: Can I bring my bike on your vehicles? A: Yes. However there is an additional charge of $30 and bicycles must be contained in a box. Q: Do you offer discounts for students or seniors? A: We require a minimum of four reservations in order to run each tour. Q: Is the Maligne Lake Boat Cruise wheelchair accessible? A: Our guides will assist physically challenged guests onto the boat. Q: Can a child (under 12) travel on your vehicles unaccompanied by an adult? A: Minors under 12 must be accompanied by an adult. Q: I want to reserve a private tour, what do I need to do? A: Contact our reservations team at res@sundogtours.com or call toll-free 1.888.786.3641. Q: Who do I contact regarding tour itineraries, pricing and/or guide availability? A: Contact us at tours@sundogtours.com or call toll-free 1.888.786.3641. Q: What are your hours of operation at your main office in Jasper? · Summer (May through September) daily from 8 a.m. to 6 p.m.
Q: Are reservations required for participating in an organized tour? A: Yes. Please contact tours@sundogtours.com or call toll-free 1.888.786.3641 to book. Q: Do you offer tours in winter? A: Yes! See a full list of our winter tours here. Please note all of our winters tours are weather dependant. Q: Is the Columbia Icefield tour open in winter? A: No. The tour operates from mid-April to mid-October. Q: Can children (under 12) participate in the Columbia Icefield Tour? A: Yes. This tour is appropriate for all ages. Q: Do I tip my guide or driver? A: It is customary to tip but is neither required nor expected. 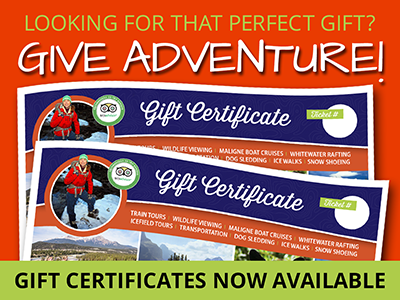 Q: Are your guides qualified or certified to operate tours? Q: Do tour packages include flights? Q: Do you provide car seats for children? A: We do not provide car seats but please let us know at the time of booking if you are planning to bring one.